Much of the plant and equipment purchased from The Worcester Engine Works Co Ltd was not required by The West Central Wagon Co Ltd who instructed Messrs. Fuller, Horsey, Son & Co of London to auction the surplus items. On 27/8/1872 and the following days an auction was held at the works. The Times newspaper reported (31/8/1872) that many firms and companies of importance were represented at the auction including Mr Armstrong (GWR), Mr Johnson (Bristol and Exeter Railway), the London & South Western Railway and agents of Irish railway companies. The total sum realised being over £20,000. Local buyers includes McKenzie, Clunes and Holland which purchased a steam hammer and other machines. The Engineer (as reported in the 5/10/1872 issue of "Auction") described the event as being "perhaps the most extraordinary sale of machinery that has ever taken place". William Wainwright, who lived at nearby Rainbow Villa in Station Walk, was the manager of the company. He had previously spent nearly twenty years as Superintendent of the running sheds and rolling stock department of the Oxford, Worcester & Wolverhampton Railway (Auction, 5/10/1872). A reporter from The Berrows Worcester Journal was given a guided tour of the wagon works and his article appeared in the journal on 30/11/1872. In the Drawing Office the reporter was shown plans for carriages for the Monmouthshire Railway & Canal Company to be fitted with Fay's patent brakes. In the foundry were bridge parts for the Great Western Railway and a cylinder for Hill Evans & Co's stationery engine. Outside the foundry was an open piece of land where sidings were to be made for the reception of wagons. The report states the wagons in which coke is sent out from the gas works and coal brought back are conveyed over the company's line, and at the time of the visit there were on the company's siding a number of wagons constructed for the gas works and on which were prominently displayed the city arms which are the trade-mark of the company. At least initially the company appears to have been successful as the Berrows Worcester Journal reported (15/11/1873) that recent orders included carriages for the Neath & Brecon Railway, 200 wagons for the Great Eastern line, 250 for the Great Northern Company, 200 timber trucks for the Midland Company and a large number of wagons for Messrs. Allsopps' brewery at Burton. This glowing picture disguised a problem that was eventually revealed to shareholders at the fourth ordinary general meeting of the company reported in the Berrows Worcester Journal on 3/1/1875. The Chairman, Alderman H.. Willis, remarked that the Directors met the shareholders with heavy hearts in consequence of not having a more favourable report to present. He then described how the first two or three orders had been executed at a loss and that lately there had been only one order (for £2,925 from the Bristol and Exeter Railway) during the period from 8th June to 7th October (1864). The meeting appointed investigators to look into the affairs of the company. This concluded that the business was not viable and at an Extraordinary General Meeting on 13/4/1875 (and confirmed on 30/4/1875) a resolution was passed to voluntarily wind-up the business. The meeting appointed Josiah Stallard (Wine Merchant of Worcester) and Edward Saville Foster (Accountant of Sheffield) as liquidators. However, on 4/6/1875, two of the creditors of the company (Thomas Adams Abraham Knowles and Henry Ogden Adams who were Timber Merchants of Crescent Wharf, Birmingham)(and others on later dates) petitioned the Lord High Chancellor of Great Britain. The petition was heard in the Court of Chancery on 25/6/1875 where it was ordered that Abraham Knowles and Charles Hoskins Low (a Timber Merchant of Canada Wharf, Bristol) be added to the list of Voluntary liquidators (REF: PRO). The liquidators, having been instructed by the Trustees of the Debenture holders, appointed Messrs. Fuller, Horsey, Son & Co to sell as one lot the whole of the freehold works and estate. The works included all of the property between Shrub Hill Road and Shrub Hill Station. Also included was the freehold of land between the canal & Shrub Hill Road which was let on lease to Messrs Clunes & Holland (expiring at Christmas 1877) and the South Wales & Cannock Chase Coal & Coke Co Ltd (expiring at Lady-day 1878). The rent being described as an inadequate £340 per annum. An auction was held at 3pm on Wednesday 1/3/1875 but no buyer could be found(REF: Liverpool Mercury 12/2/1875). The liquidators then appointed Messrs. W.H. & J.A. Eadon to sell by auction the whole of the stores, raw materials, iron, steel, six portable steam engines, locomotive engine, wagons, tools and loose working plant etc. The sale was advertised locally and in newspapers such as The Bristol Mercury & Western Counties Advertiser (22/4/1876 edition). The sale was described as important to railway companies, machinery brokers, wagon builders, iron merchants, tool dealers and others presumably to attract a wide range of bidders. The auction took place from 11am on Tuesday 30th May 1878 and possibly on Wednesday 31st May 1878 at the wagon works in Worcester. Items of particular interest were a 40-ton travelling crane and several other cranes, eleven new coal wagons and a "Locomotive Steam Engine". (REFS: The Bristol Mercury; The Western Counties, Monmouthshire & South Wales Advertiser. On 12/8/1876 the Berrows Worcester Journal reported the results of the auction. Lots 1, 2, 3 and 8 were not sold. Lots 4, 5, 6 and 7 were sold to Mr Thomas Adams, timber merchant of Birmingham. Lot 8 was sold to the Worcester Gas Company. The total proceeds being £11,300. As all of the assets had not been disposed of the liquidators could not wind-up the business. This would have been a most unsatisfactory state of affairs as it would further delay payments being made to the creditors and incurs additional costs in maintaining the assets. The Worcester Engine Works remained empty until briefly being used to stage the Worcestershire Exhibition in 1882. It is not known (by the MIAC researchers) as to why the final winding-up meeting of The West Central Wagon Co Ltd was held on 8/7/1886 (REF: PRO) as no information can be found as to the date of the sale of remainder of the Worcester Engine Works. Perhaps Dutton, who started business in 1888 had made a prior arrangement to buy the works with payment being made by way of a twenty-five lease/purchase agreement. The other complication was the unsold Lot 8 which was let by way of short-term lease to Clunes & Holland. It is reasonable to assume that between 1877 and 1886 this part of the site was sold to them as McKenzie & Holland traded from here until 1921. For convenience photographic evidence of this site are included in the Heenan & Froude entry. 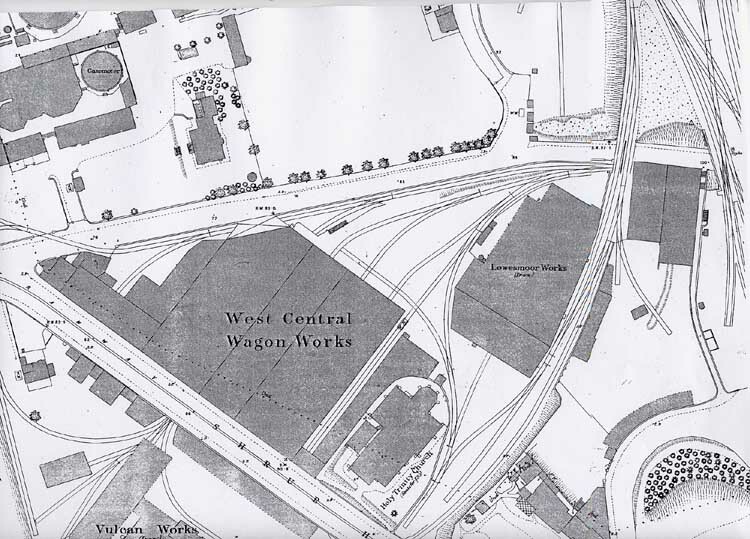 This 1882 Ordnance Survey map shows the West Central Wagon Works. Mckenzie & Holland occupied the site on the south side of Shrub Hill Road marked as 'Vulcan Works', the sidings also went across Tolladine Road into Gas Works. The 'Vinegar Works' branch is the line to the far right of Lowesmoor Works (Iron) and Holy Trinity Church.